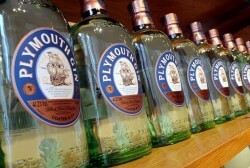 This summer gin loving travellers can start their holiday in style with a taste of Gintime favourite Plymouth Gin. Following an amazingly successful trial run at London Heathrow’s Terminal 5 Plymouth Gin has launched two dedicated gin bars – at Gatwick on from July 1-22 July and at Heathrow’s Terminal 3 from July 23 until August 26. Passengers also have the opportunity to sample Marguerite and Gimlet gin cocktails, both closely associated with Plymouth Gin for over a century, an initiative that ties in with a new advertising campaign by Plymouth Gin owners Pernod Ricard. World Duty Free Group liquor category manager Nigel Sandals also commented: “We were delighted with the response from our customers during the Plymouth Gin activation at London Heathrow T5. They loved the opportunity to get to know the brand’s background, whilst enjoying a luxury experience at the in-store gin bar. As a result, we’ve worked very closely with Pernod Ricard Travel Retail Europe to expand the Plymouth gin activation. We look forward to welcoming gin enthusiasts from around the world and sharing a cocktail with many more customers within our stores”.